A new website is betting you're willing to dish about your co-worker's job performance just as you would a Netflix movie or an Amazon purchase. The site, dubbed Unvarnished, came out of private beta testing last week and aims to create an open forum to rate professionals in the workplace  for better or for worse. It's a concept that has caused some controversy, particularly since Unvarnished allows employees to be reviewed anonymously and with no way of removing a negative review. But the co-founders, veterans of sites like LinkedIn and eBay, think there's a market for honest, unfiltered feedback about how individuals perform in their jobs and say their site will ultimately be more useful than the carefully selected job references or curated blurbs on someone's LinkedIn profile. "We're trying to take how professional reputation works in the offline world and port that online," says co-founder Peter Kazanjy. Here's how it works: Say you have a gripe with your co-worker. 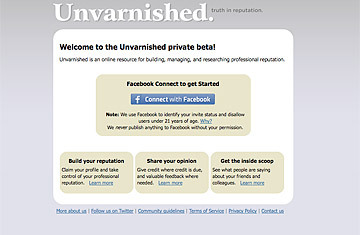 You can log in to Unvarnished using your Facebook profile and either create a profile for your co-worker or add a comment to a page already created, assigning them a rating and giving a description of your issue. Your name is kept anonymous, meaning your co-worker can't seek you out for retribution, and your comment is left there for the world (and potentially future employees) to see. Want to give someone an attaboy? You can add that comment on their profile too. The site aggregates reviews to spit out your professional reputation on a five-star scale, along with comments from individual reviewers. It's not a completely new idea. Sites like Rate My Professors and Rate MDs have proven popular for assessing members of specific professions. But Unvarnished is unique in the scale of its sounding board: you can rate your doctor, IT guy or boss without ever giving away your identity. Kazanjy says the anonymity is necessary; without it, people couldn't be "candid or nuanced in their reviews." But at the same time, it opens the system up to potential abuse. Feel slighted by your boss? Take it out anonymously on his or her Unvarnished page; there's little chance you'll be caught, and potentially very real consequences for your boss's professional reputation. Kazanjy says Unvarnished has controls in the system to prevent people from simply trashing their co-workers. All users must "authenticate" through their real-world Facebook profile, providing the company with actual names and personal information in case of a defamatory post. The system is closed to anyone under the age of 21, and abusive comments can be reported and removed by administrators. Users also gain authority based on the helpfulness of the reviews they provide. "We're not being Pollyannish about [anonymity], but we also don't want to throw out the baby with the bathwater," says Kazanjy. "We don't want people to not give out negative reviews." And while you can't remove a review, there are some tools to manage your reputation on Unvarnished. If you log in and take ownership of your Unvarnished profile, you have the ability to respond to each post, giving your side of the story. You can also invite trusted contacts to contribute reviews of their own, in essence bringing friends to bear to burnish your reputation. Ultimately, Kazanjy says, the controversy surrounding his site isn't anything new. "If someone has an ax to grind, they can already make a smear campaign behind your back," he says. "It already happens in the online world every day." Unvarnished may make passive-aggressive digital warfare easier, but at least it gives some tools to fight back. See the best social-networking applications. Watch TIME's video "50 Best Websites: 5 You May Not Know."